Wedding invitations are one of the most important elements in wedding preparations. 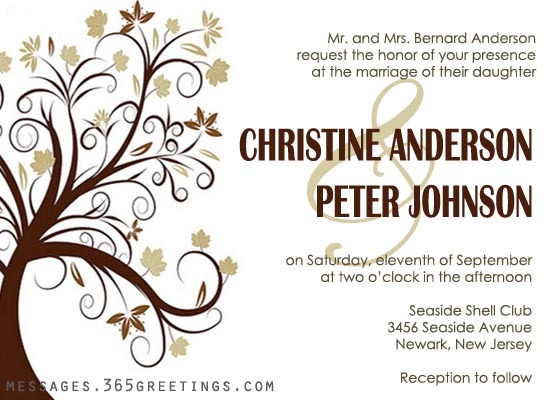 One needs to make sure that the proper etiquette in writing wedding invitation wording is observed. Details of the wedding must be clearly stated in the wedding invitation including the hosts, bride and groom, venue, time and date of the wedding. 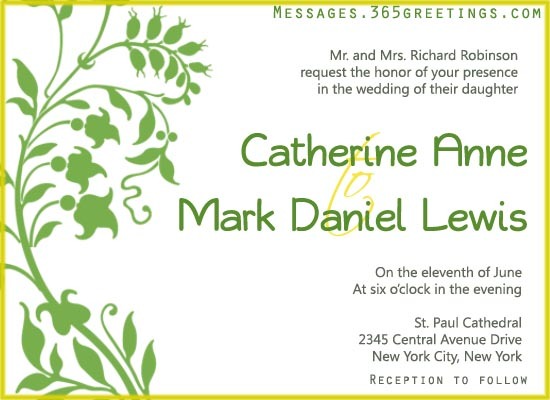 One can also include the theme of the wedding in designing the invitation. Wedding invitation wording may vary depending in the situation. Also, the wording of your wedding invitation may be different depending on the theme you choose, whether casual, traditional or modern. Most of you might get confused on writing the proper wedding invitation wording since your situation may be different from others. But whatever situation you may have right now, we hope that these samples of wording can help you. Lost for words? Don’t know what to write in your invitation? Then go for the basic, standard wording. In standard or traditional wedding invites, the wording includes the bride’s parent requesting the presence of the guests for the wedding. Here are some samples you may use. Traditionally, the parent of the bride are paying for the wedding. That’s the reason why it’s the bride’s parents who are requesting for the pleasure of having your company in the wedding of their daughter. But since the world has changed and different instances have made writing wording for wedding invites more complicated. Giving the invitation etiquette some consideration, wording may differ depending who will host or pay for the wedding. Here are some examples of wording for wedding invites. will be forever united in love. Now, if you’re planning to have a destination or beach wedding, you may want to make your wording suitable or relevant to your theme. For example, in a beach wedding, your wording may consists of short poem about sea or beach. You can also include the name of the destination, for example Las Vegas. Have it a feel of Las Vegas. See some example below for some idea. But as the world changes and becomes modernized, brides and grooms may want to stay out of something traditional. Same goes with writing your wedding invitation. Gone are those days that you have to include every little detail of your wedding. Including some funny quotes or casual wording can also be an option. Here are some samples of informal or contemporary wedding invitation wording. March 20, 2013, 3:00 p.m.
Atlanta, Georgia Love blooms until forever. on the day of our eternal bond. Are you planning to tie the knot in a catholic church? Then you may want to make the wording suitable for the celebration. Aside from the classic or traditional design of the wedding invitation, the wording must include some sort of traditional details. And of course, include which Church you guys will be married. How about adding humor to your invitation? There are so many funny quotes or wording that you can include to your wedding invites. Aside from the funny and hilarious wedding invitation theme, have something to support the visual – yes, wording. Here are some samples of funny wording for invites. Feel free to add yours. But it takes a lifetime to MEAN it. That’s one tough job for sure. And we can call it our home. Are you looking for wording samples for Indian wedding? How about those who are planning to have a second wedding? Don’t worry, we also covered that topic. Here are some ideas and examples of wording for Islamic, Indian, and second wedding invitations. We also include some wedding reception invites wording for your perusal. Their journey forever has just started. March 20, 2014, at 6:00 p.m.
As mentioned earlier, there are some considerations to put in mind when writing an invitation. Here are some tips and guidelines that will help you keeping yourself right in the track. No punctuation should be used with the exception of courtesy titles such as Mr. and Dr. Numbers, dates and time must be spelled out. For example, instead of March 21, spell it out as the twenty-first of March. You don’t have to add the year but if you must, spell it out as well, such as two thousand thirteen for 2013. You don’t have to capitalize each word every line. Remember, capitalized words mean that they are the start of the sentence. Limit the use of abbreviation. If you need to include commonly abbreviated words like days of the week, or street, make sure that you write it in its full spelling. Limit the use of contradicting words like “Don’t”, Can’t” etc. If you must, write it as “Do not” or Cannot. The RSVP must be the address of the hosting party. Send the letter ahead of time to give the guests preparation time for the wedding. Make sure that the details are completed before sending out your invitation. If you must to include the dress code for the wedding, you can write it in the bottom right corner of the wedding invitation. You can include whether it will be “casual attire”, cocktail attire, etc.